250/400/600w Growing Setup with Magnetic Ballast. 4 Carbon Filter, Fan and Ducting. Select from sizes: 80x80x160, 100x100x200, 120x120x200. Completely Light-tight, waterproof and air-tight material. Silver Mylar lined interior for maximum use of light. 600D polyester aluminum coating inside. Mylar Siler, SBS Zips, Thick Cloth. 100% PVC FREE WILL NOT KILL YOUR PLANTS! Removable water-proof floor for spillages. 3x Inlent/Outlet adjustable vent holes 4"-8". Quick and easy to assemble, lightproof, brilliant silver interior. Adjustable intake and exhaust vents. Military grade zips give full access to the crop. The ideal environment for home cultivation! 2 Side excess on both sides. 4 Detachable air window flaps for air flow on bottom sides, it can be close or open. 5 German branded zipper pullers. 6 Front two-way zipper, opens from top and bottom. The latest HPS to MH Conversion Grow Light is Metal Halide bulbs designed to work in both GROWLUSH HPS ballast and Metal Halide (MH) ballast. The advantage of a MH lamp in the growth phase of a plant is increased vegetative growth as well as reduced internode length. Expected Life: 10,000 hours. Lumen: 52300, 70600, 133900 lumens respectively. Daylight for super fast growing. Strong power to penetrate fog. High output, high luminescence efficiency. Fit for all standard MH grow light systems. Long life and high efficiency for energy saving. Accelerate development and hearty flowering! 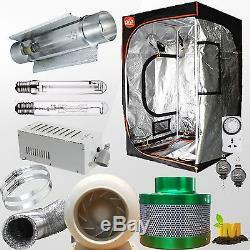 HPS light is for better flowering, which is best for your plants chlorophyll production. It is especially productive for flower seedling development. Power: 250, 400, 600 watts. Expected Life: 29,000 hours. Lumen: 29500, 65200, 91000, 150600 respectively. Contains more red spectrum, which is best for flowering. Fit for all standard HPS grow light systems. Fit for the Heliophile, such as Rose and Camellia, which grows better at longer sunshine time. Gardeners and professional Growers are looking for reliable results from their HID lighting needs, look no further than a high quality and long lasting Magnetic Ballast! 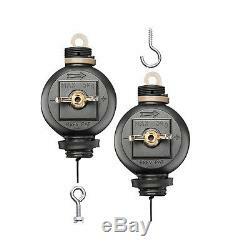 Its straightforward heavy duty quality and highest insulation level of Class-H. Highlight its easy operation, with headache-eliminating plug and play with 220/240-volt supply. This 250-600 watt Metal Halide & HPS Ballast includes a 220-240 volt power cord. 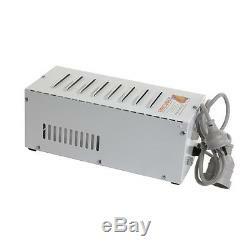 250W, 400W, 600W MH & HPS CE Certified, enclosed control Ballast. Metal case capacitor is used for long lasting performance. Free standing on bench with rubber feet to reduce noise and vibration when it operates. Feature one suitable output socket, making it compatible with all reflector lamp cords. Simply insert the appropriate lamp into reflector and plug & Plug. Comes standard with a 220 - 240V power cord. The ballast is made from sturdy, powder-coated, steel housing with cooling louvers all around. Cool Tube Reflectors are suitable for HPS and MH tubular lamps up to 1000 watt. The reflectors are fitted with pre wired lamp holder and cord, aluminum reflector inner & Outer Reflector and outer, heat resistance glass and 6 ducting setup. The reflector is PLUG & PLAY and ready to grow! This listings includes two duct reducers 4" to 6" so the cool tube can be attached to the 4 ducting! 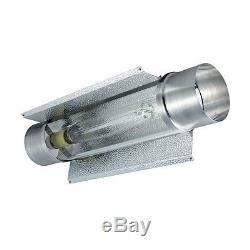 The Air Cooled full sealed reflector features a heat resistance glass tube, a European aluminum insert inside and outside above the tube that offers 95% reflectivity. Power is provided via a pre wired 600-volt E39/40 lamp socket outfitted with the industry-standard common lamp cord. The light fitting has 6 (150mm) flanges on both ends. Covering large area, Plenty lights and reflection, NO HEAT, good for all growing process. Measures 600mm long x 150 mm (6) diameter. 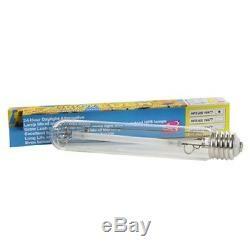 Suitable for all HPS and MH tubular lamps up to 1000w. 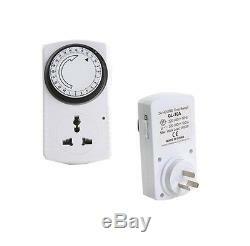 International Electrical Safty certificates: UL, CE, RoHS and Australian C-tick N3499. Works best with enclosed grow spaces as an air duct, the Ventilation fan provides Super power ventilation for its size. 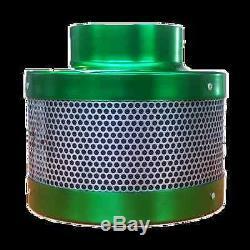 Great for venting air into greenhouses and grow rooms. Will provide your plants with a consistent strong fresh airflow which as we know is a requirement for grow room setups. This Inline Exhaust Duct Blower features power motor and an aerodynamically designed shape. It is able to move air through long stretches of ducting, grow light reflectors or carbon filters. With a tape flange, it is rather convenient for you to place the ducting on the blower and tape it in place. Activated carbon is commonly used for odour control as it has an amazing ability to adsorb contaminants from a variety of waste streams. Carbons can also be impregnated with a range of other chemicals which help increase the removal efficiency of certain compounds, for example, caustic impregnated activated carbon works very well on H.
S and mercaptans in moist air streams generated from hydroponic grow room and dark room. Air flows evenly across the carbon and with accelerated kinetics and increased surface area. Our Carbon Filters have faster adsorption rates, which mean better results than most other carbon filters. Easy to set-up and requires no electricity. A Carbon Filter removes any and all airborne smells associated with your crop. Basically to get rid of all smells from your crop you suspend a carbon filter from the ceiling (with chains) and attach to the intake of your extractor fan. The air is then drawn through your carbon filter which absorbs ALL the smell before being extracted outside. 4 Flange x 150mm height. Aluminum Silver Ducting Fan Duct The worm drive allows for easy adjustment of the heavy duty mechanism so loosening and tightening can be done with the simple twist of a screwdriver. Aluminum construction for long time performance, total flexibility and heat exhaust capabilities. 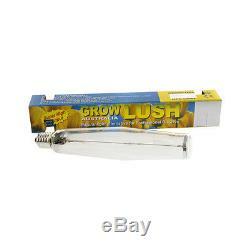 Used for connecting exhaust blowers to air cooled grow lights and venting. Allowing cut to the length you want, easy to work with! Heavy Duty Timer is suitable for "switching, on/off" normal iron core and digital ballast, and any other electrical equipment! Plug in socket, and connect this facility with the home appliance. Push down the joint slices according to the working duration of home appliance as expected (15 min, for one slice, adjustable for 24hr). Turn the dise following the arrow's direction until the mark is pointing to the current time. Package Size: 100 x 100 x 50 mm. Package Weight: 0.5 kgs. 1x Vent Fan 4 GL100. And the following day if it's after Monday to Friday. We advise you to use a reputable carrier service when returning your goods. Bank transfers are currently not accepted. We guarantee that your issue will be solved quickly. We usually respond within 24 hours on weekdays. The item "250/400/600/1000W Magnetic HID Ballast Grow tent Cooltube MH/HPS Hydroponic kit" is in sale since Tuesday, April 11, 2017. This item is in the category "Home & Garden\Yard, Garden & Outdoor Living\Gardening Supplies\Hydroponics & Seed Starting\Grow Light Kits". The seller is "melbournehydro" and is located in Melbourne, VIC.